To Fool the Rain is a beautifully written book that depicts the lives of Heiti’s poorest, with a specific focus on women who work hard every day to create a better life for themselves and their families. 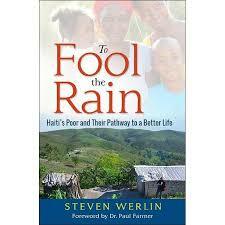 Author Steven Werlin takes a lot of care in telling the stories of women who live in the worst kind of poverty imaginable, sometimes not having any money or food and being in the heartbreaking position of not being able to feed their children or send them to school. While the circumstances of these women are sad and sometimes even tragic, the book and the stories of the women portrayed in this book are uplifting and full of hope. Werlin writes in detail about “Fonkoze” a small loan program which gives Heiti’s poorest a chance to make a better life for themselves, not only by giving them small loans to start a business, but by giving them training, teaching them necessary skills, and providing them with mentors and case workers who will support them and help them succeed. I thoroughly enjoyed reading the stories of these women, their determination and motivation for change and creating a better life for themselves and their families. As well I found the information about “Fonkoze” extremely helpful and eye opening, and would recommend this book to anyone who is interested in learning about practical ways of helping those less fortunate, not by giving them charity or hand outs, but by providing them with lifelong skills and knowledge as well as the means to start a small business to create a sustainable and better life. I was provided with a review copy of this book.